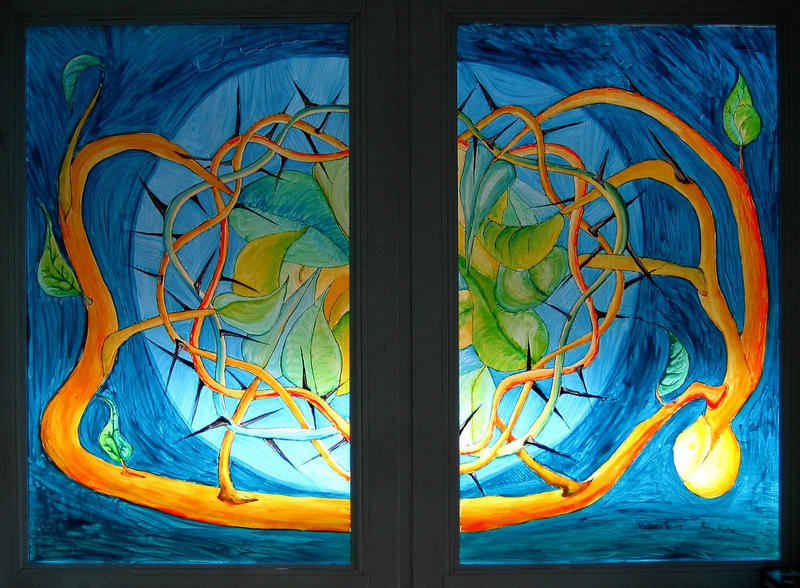 a painted window at the YMCA training center for German leadership in Kassel. "Honor," Karen Georgia Thompson, Sermon Seeds, 2017. Preaching Helps (Pentecost +7). Rev. Dawn Chesser, United Methodist Church General Board of Discipleship, 2014. The Lectionary Lab, the Rev'ds Dr. John Fairless and Delmer Chilton (aka "Two Bubbas and a Bible"), 2014. Lectionary Lab Live podcast. 2011. Evangelectionary for July 27, 2014, Heather Lear, Evangelism Connections, 2014. Jesus Now, Proper (Ordinary) 17A, lectionary, study and worship resources from Faith Futures Jesus Then & Now. Rumors, for July 27, 2008, Ralph Milton, "Sermon helps for preachers with a sense of humor." "Hide Away," Matt Skinner, WorkingPreacher.com, 2017. "Parabolic Promises," David Lose, 2017. "The Kingdom that Boggles Your Mind," Nancy Rockwell, The Bite in the Apple, 2017. Commentary, Willie James Jennings, The Christian Century, 2017. "Kingdom Come (Undone): When Most Christian States Are Also the Poorest," Joseph Wiinikka-Lydon, ON Scripture, 2017. Lectionary Blogging, July 17, 2011, John Petty, Progressive Involvement, 2011. 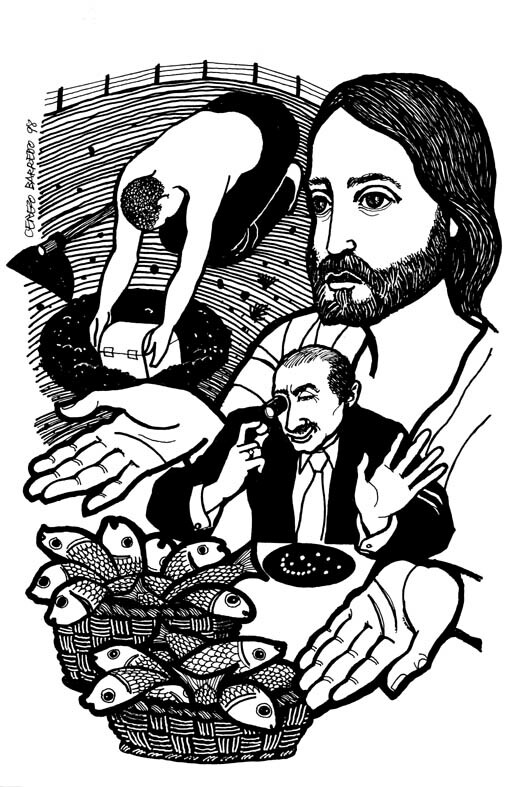 "Jesus Condones Weed," Peter Woods, I am Listening, 2011. "Wheat and Tares," Suzanne Guthrie, Soulwork toward Sunday: At the Edge of the Enclosure, prayers and meditations, 2011. RCL Leanings, commentary and discussion, RevGalBlogPals, 2014. "Good Advice and Good News," Alyce M McKenzie, Edgy Exegesis, 2014. 2011. "You belong to God," Dan Clendenin, Journey with Jesus, 2014. 2011. 2008. 2005. "The Power of Gospel and Prayer," Steve Godfrey, Church in the World, 2014. "The Morning After," Linda Fabian Pepe, Theological Stew, 2014. "Do You Really Get It?" Sharron R. Blezard, Stewardship of Life, 2014. 2011. "Sucker Day,," Steve Goodier, Life Support System, 2014. "Not Just for Funerals," David Lose, Dear Working Preacher, 2011. The Painted Prayerbook, "The Old and the New," Jan Richardson, 2011. Use of images. "Shocking," Miriam's Tambourine, reflection, artwork, worship resources from Memphis Theological Seminary. Liberal Lectionary Resources, Proper 12A, Brian Jackson, 2011. Sermon Notes for July 24, Michael Rich, In-Formatio, 2011. "Giving It All Away," Peter Lochhart, Reflections on Faith & Spirituality, 2011. "The Old Guard Alternative," Tim Good, The Naked Alien, 2011. "Sighs too deep," Melissa Bane Sevier, Contemplative Viewfinder, 2011. "Bagel, Ciabatta or Roll?" Neil Chappell, a weird thing, 2011. Taking the Long View, Bob Cornwall, Ponderings on a Faith Journey, 2011. Dylan's Lectionary Blog, Proper 12. Biblical Scholar Sarah Dylan Breuer looks at readings for the coming Sunday in the lectionary of the Episcopal Church, 2005. "With Faith You Can Do So Much," Lee Alison Crawford, Proclaiming Gospel Justice: Reflections on the Scriptures and Progressive Spirituality, The Witness, 2005. "Discerning What is Right," Luke Timothy Johnson, 1990. "Exceeding Generosity," Enuma Okoro, "God's Care Package Is Bursting," 2011. "A Pearl Like a Fishnet," Laurel A. Dykstra, "Life Lessons," 2008. "How God Can Use Us to End Hunger," David Beckmann, Day 1, 2017. "Finding value in what others overlook," the Rev. Danae Ashley, Sermons that Work, Episcopal Digital Network, 2014. Ministry Matters, July 27, 2014. Propio 12 (A) – 2014 POR EL RVDO. DR. HERNÁN AFANADOR-KAFURI, Sermones que Iluminan, Episcopal Digital Network, 2014. "God's Love," Frederick Buechner Sermon Illustrations. Bible Study, Proper 12A, 2014, Jessie Gutgsell, Sermons that Work, Episcopal Digital Network. Estudio de la Biblia. Propio 12 (A), por Jessie Gutgsell, Sermones que Iluminan, Episcopal Digital Network, 2014. Worship Planning Helps (Pentecost +7): Worship & Preaching Notes, Hymn Suggestions and Worship Resources from the United Methodist Church General Board of Discipleship. Life In Liturgy, Pentecost +7, 2014. Mustard Seeds, "Signs of God," Proper 12, 2014. A lectionary-based ideas resource for leaders of contemporary worship, Ann Scull, Gippsland, Australia. Worship resources for Proper 12 by H. Burnham Kirkland from SermonSuite. Lectionary Liturgies, Ordinary 17, Thom M. Shuman, Presbyterian Church (U.S.A.), 2014. Liturgy for the Celebration of Life, Pentecost 6A. Liturgies from a Progressive/Post-Liberal Theology, Revd Rex A.E. Hunt, The Uniting Church of St James Curtin, ACT, 2011. Worship Resources, July 24, 2011, Rev Mindi, Rev-o-lution, 2011. Worship and Liturgy Resources, Ordinary 17, by Rev David Beswick, Uniting Church in Australia. Lector's Notes, OT 17, Gregory Warnusz, Saint Jerome Parish, Bellefontaine Neighbors, MO. Notes and commentary for those reading this week's lectionary texts to the congregation. 21st Century Worship Resources, Pentecost +7, UMCDiscipleship.org. Offertory Prayers, Pentecost +7, UMCDiscipleship.org. Sunday Prayer 12A / Pentecost 6, RevGalBlogPals, 2011. The Timeless Psalms: Psalm 105:1-11, 45b, Joan Stott, prayers and meditations based on lectionary Psalms, 2014. 2011. HermanoLeón Clipart, Ordinary 17, Free clipart, backgrounds, slides, etc. Ordinary 17 at Cerezo Barredo's weekly gospel illustration. Follows Latin American Roman Catholic gospel reading, though most gospels texts/themes are found in the index. Liberation emphasis. "Carabiner/Climbing Clips," video, John Stevens, Dollar Store Children's Sermons, 2014. Hymns of the Spirit Three, Proper 12A, Richard E. Hurst, Universalist National Memorial Church. Psalm Settings by Dale A. Schoening, Metrical Psalms: Psalm 105:1-11, 45b set to Cleansing Fountain (86 86 D), Psalm 119:129-136 set to Arlington (CM - 86 86). Hymn and Song Suggestions, Proper 12A, 2014, annotated suggestions from Natalie Sims, Singing from the Lectionary. Lectionary Hymns, Pentecost +7, UMCDiscipleship.org. Together to Celebrate, July 27, 2014, David MacGregor, Uniting Church in Australia. Contemporary Christian Music resources. Lectionary Puzzles, Proper 12. Word search puzzles in RTF or plain text, by Reg McMillan, St.Stephen's Presbyterian Church, Peterborough, Ontario. The Big Influence Of Small Things -- Children's sermon by Brett Blair & Tim Carpenter based on Matthew 13:31-33, 44-52 from SermonSuite. Faith Formation Journeys, Children's Sermon, Pentecost 6A, 2011.